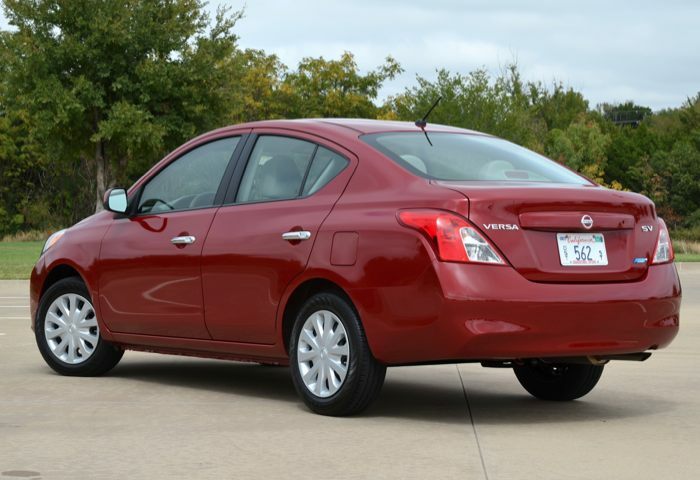 The new Versa Sedan from Nissan offers some of the cheapest real estate on the market today. Completely redesigned for 2012, Nissan touts the new little four-door as “Small on the outside, big on the inside.” And actually it isn’t really that small on the outside. What is small is the pricetag as compared to the market today. For 2012, Versa Sedan rolls in at just under 11 grand. Yes, $10,990 will get you a brand new Nissan, if you can find one of those entry models on the dealer lot. Figure spending something more in the ballpark of 15-16 large for one with most of the necessities. Other taglines associated with the new Versa are “Small when you need it, Big where you want it” referring to a small powertrain that sips fuel ever-so-miserly but rearseat legroom that competes with large luxury sedans costing 4-5 times more. 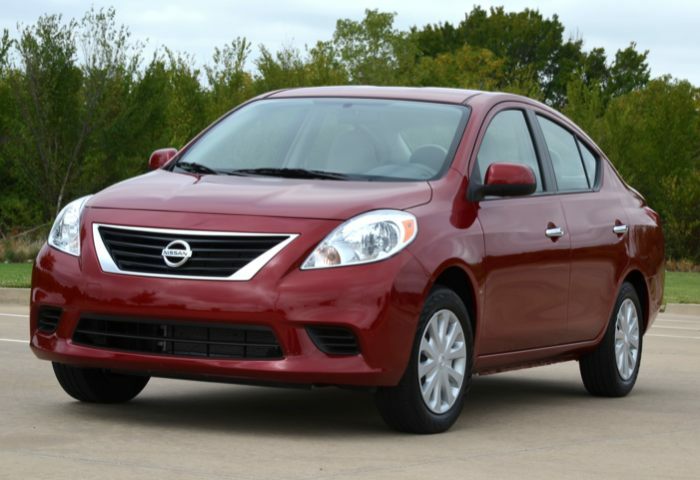 As with most new Nissan products, the 2012 Versa Sedan comes with a peppy-for-its-class 1.6 four-cylinder engine backed by a CVT transmission. This combination, while a bit noisy when accelerating at a brisk pace, offered surprisingly quick action and very decent fuel economy of 30 mpg city and 38 mpg highway. Most of our driving was in town and we saw nearly 35 mpg even when being a bit abusive on the accelerator. I mentioned the rearseat space a bit earlier. 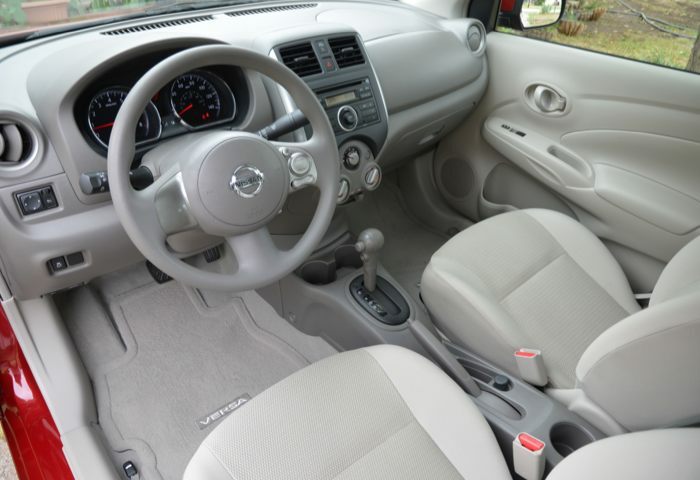 The new Versa Sedan is cavernous inside. Four adults ride in comfort although low pricing does impact the list of basic amenities a bit, like, NO VANITY MIRRORS. Not for myself, of course, but the “civility” of my civil union was put to test when Tish wanted to check her makeup. While the standard amount of space was available on the window sticker the new Versa Sedan SV we recently took delivery on used less than half of that provided. There was a stereo system but no power trunk release at all, power windows and locks are not on the base model car, and I really cannot remember the last time I rode on 15-inch wheels and tires. Oh, and carpeting was extra, too. Nissan does include a host of safety equipment in the new Versa Sedan including front and side airbags, ABS braking, traction control and vehicle stability control and even side curtain airbags and tire pressure monitoring system. 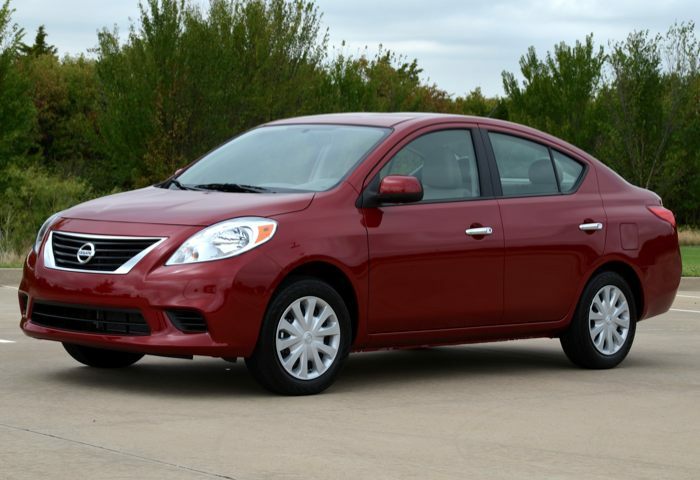 A base S Versa Sedan is offered with a five-speed manual gearbox but upfit SV and SL models only arrive with the CVT. Should you wish to load your new Versa Sedan with current technology Nissan does offer Convenience and Tech packages with the latter bringing nav and XM radio. Our SV tester with only the carpeting added to it came in at $15,490. 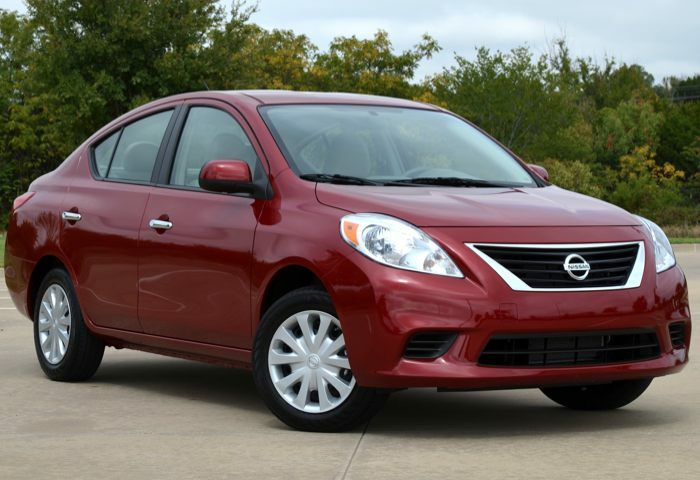 Let me not mince words here, the new Versa Sedan from Nissan is cheap. It does offer value by today’s standards and it DOES offer an unbelievable amount of space but it is still a cheap car. Even the best social marketing plans by Nissan will probably not elevate this vehicle to iconic status but for an affordable deal it is worth a look. And for those of you wondering, the Versa hatchback was not touched this model year, it is a carryover. Nissan could only afford to send one of its kids to college this year.